(Relaxnews) - The world’s highest suspended hotel suite has opened in Abu Dhabi 650 feet (200 m) above ground level featuring a spa, movie theater, 24-carat gold leaf accents and private elevator access. 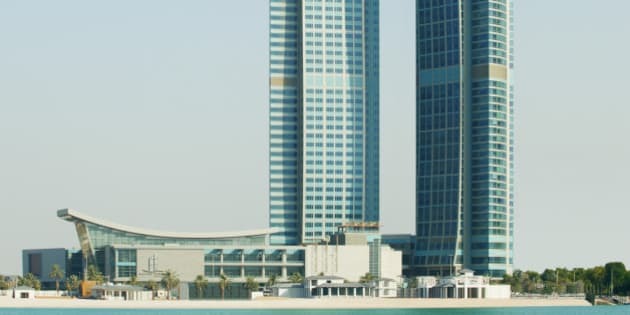 Bridging two towers of the Nation Tower, the St. Regis Hotel’s Abu Dhabi Suite can be seen from ground level as the 11,600-square foot (1,078-square meter) unit that connects the two skyscrapers. The luxury suite features cascading crystal decor, 24-carat gold leaf accents, leather wall tiles, velvet upholstered walls and glass mosaic patterns, and provides panoramic views of the Arabian Gulf, the Corniche and the city skyline. The three-bedroom apartment also comes with an in-house spa, movie theater, kitchen and dining room, fully-equipped gym, private elevator access and a grand majlis or salon for receiving and entertaining guests. Earlier this month, the St. Regis Saadiyat Island Resort, sister to the St. Regis Abu Dhabi, touted its Royal Suite as the biggest in the United Arab Emirates. The 22,600-square foot (2,100-square meter) apartment features an outdoor swimming pool, movie theater, spa, and games room. The JW Marriott Marquis Dubai meanwhile, holds the title of the tallest hotel in the world, standing 355 meters or 1,164 feet above street level.